Ghananie.Com: "I don't throw away cash" - Alan "Cash"
Mr Alan Kyerematen, a presidential aspirant of the New Patriotic Party has said that contrary to the notion that he was "throwing away cash", he was rather addressing the concerns and welfare of the party's foot soldiers. "It is a sign of appreciation to give a token as transport allowance to the party's foot soldiers, who have travelled long distances to hear my campaign message," he said.Mr Kyerematen was addressing polling station chairmen and constituency executives of the NPP at Kumbungu in the Tolon/Kumbungu District on Thursday as part of his tour to canvass for votes for his presidential bid. He said it was unfortunate that some of his colleague aspirants were turning round to accuse him of "wasting money" instead of assisting the foot soldiers of the Party.Mr Kyerematen said he was one of the aspirants to have visited all 230 constituencies in the country and interacted with NPP foot soldiers, adding that he had fulfilled his promise of providing them with means of transport to enhance their campaign activities.He pledged to provide a pick-up vehicle each to all the constituencies and a bicycle each to all polling station chairmen to facilitate their campaigning, if he is elected presidential candidate at the Party's primaries to be held in December this year. Mr. Kyerematen said the ability of the NPP to retain power in 2008 would depend on the work of the foot soldiers and polling station chairmen and urged them to embark on a house-to-house campaign to win more support for the party.He said the opposition National Democratic Congress was bent on regaining power and was spreading falsehood that the NPP government had done nothing since it came to power. 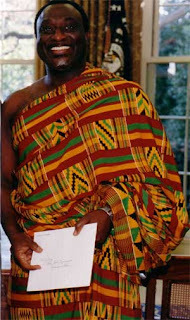 He urged them to educate the electorate on the achievements of the Party.He said the Kufuor administration had laid a solid foundation for the country and following with the discovery of oil, "we are poised for economic take off".On allegations that he was the preferred candidate of the President, Mr. Kyerematen said the President had cordial relations with all the aspirants. "Besides, he has come out publicly to deny that he was backing any of us". He told his supporters to tell any aspirant who would come to talk about the President's backing for him to concentrate on their campaign and "leave Kyerematen alone".He said: "All credible opinion polls have put me ahead of my competitors and so I have become the target of envy".